This sickle blade segment is identified as a product of Canaanean prismatic blade technology. Sickle sheen along one serrated edge indicates that it was once used to cut some type of plant fibers. Sickle blades were sometimes used to cut on both edges. On a site in the Jordan Valley in Israel called Wadi Fazael 2, it's reported that 32.6% of 43 sickle blades were reversed in the haft and have bilateral sheen on their cutting edges. This blade also appears to have traces of some type of material along one edge that may be a hafting residue, such as bitumen. Bitumen is a solid or semi-solid form of petroleum that is known to have been used to secure sickle blades onto sickle handles. Most Canaanean blades have two parallel ridges that extend down the length of the blade. 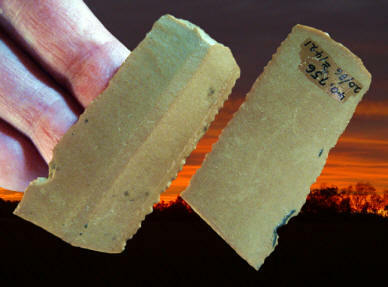 The ridges are formed along the edges of previously detached blades. This sickle blade has a third dorsal ridge indicating a fourth blade was detached from the core prior to the removal of this blade. Rosen writes that un-used Canaanean blades average about 3/4 of an inch or 2 cm wide and they can sometimes be greater than 5 7/8 inches (15 cm) long. This sickle blade was made from a non-local fine grained brown flint. It measures 2 5/16 inches (5.9 cm) long and 1 1/16 inches (2.7 cm) wide. Tell Halif is located in southern Israel along the southwestern edge of the Judean Hills. Excavation of the site was sponsored by The Cobb Institution Of Archaeology at Mississippi State University. The project began in 1983 and is called the Lahav Research Project. Eugene Futato spent four summers on the site and did the lithic analysis.